FILE - Rick Gates, then a campaign aide to Republican presidential candidate Donald Trump, is seen at the Republican National Convention in Cleveland, Ohio, July 21, 2016. Rick Gates has long been a key aide to Washington lobbyist Paul Manafort and on Monday also found himself indicted, with both accused of a money laundering scheme linked to their lobbying for one-time Ukraine leader Viktor Yanukovych before a 2014 uprising toppled Yanukovych and sent him fleeing to exile in Russia. The 45-year-old Gates met Manafort more than two decades ago when he interned for Manafort's lobbying firm. Years later, one of their clients was Russian oligarch Oleg Deripaska, who had close ties to Russian President Vladimir Putin, along with others in Putin's orbit, including Yanukovych. 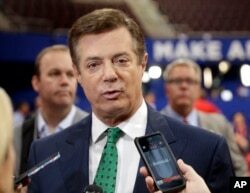 FILE - In this July 17, 2016, file photo, then-Trump Campaign Chairman Paul Manafort talks to reporters on the floor of the Republican National Convention at Quicken Loans Arena in Cleveland as Rick Gates listens at back left. When Manafort joined the Republican presidential campaign of real estate mogul Donald Trump in 2016, so did Gates, working as Manafort's deputy when Manafort served as Trump's campaign chairman from June to August of last year. One picture showed Gates standing alongside Trump as the presidential nominee prepared to address the party's national convention in Cleveland last year. Gates stayed on with the campaign even after Trump ousted Manafort when news surfaced of large payments Manafort had received for his extensive lobbying efforts for Yanukovych. Gates served as the Trump campaign’s link to the Republican National Committee, an at times contentious relationship as establishment political figures tried to adapt to the freewheeling ways and constant controversies that enveloped Trump and his campaign. Gates left the campaign before Election Day in November, but later helped plan Trump’s January inauguration and joined other Trump aides in launching America First Priorities, a pro-Trump group where he worked for awhile.